The ideal blend of beauty and function, RDV Sportsplex Athletic Club is Central Florida’s unrivaled workout experience. Health and fitness merge in our spacious world-class facility, artfully blending leading-edge technology and programs with top-tier service and a friendly and knowledgeable team. Whatever you’re looking for, we’ve got a membership that fits. Offering over 400 COMPLIMENTARY classes each month, we provide you with classes to fit even the busiest schedule. We have what you need to get moving and get motivated! Train like a pro on our 40-yard functional and sports performance turf area with its attached 3,000 square foot weight room. Enjoy spa-quality locker rooms for men, women and families. Locker rooms include free daily lockers with private rental and laundry options available, steam room, sauna, whirlpool and cold plunge. Complimentary towel service is provided. Make a splash in our indoor aquatic center featuring a 25-meter, 5 lane lap pool, family pool and warm water therapy pool. 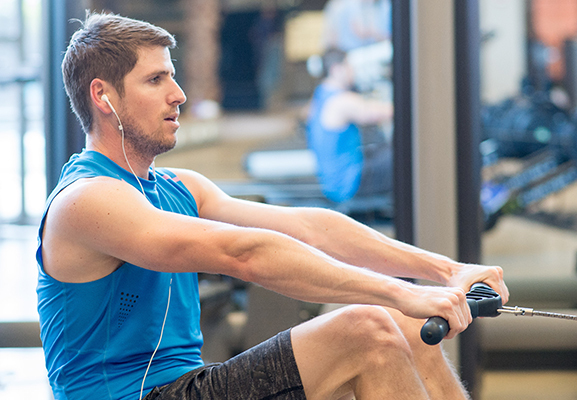 Whether you’re an experienced swimmer or just getting started, we have the program for you. From indoor basketball, racquetball and squash to six (6) outdoor tennis courts, we have everything you need to get active and have fun! Sorry parents, this amazing fun zone is just for kids! Kid’s Stuff is a 15,000 square foot supervised space for ages 0-11. Members can enjoy up to three (3) hours a day of care, while parents enjoy their workout. RDV Massage offers members and visiting guests the finest in relaxation, therapeutic, and athletic massage services. As a membership add-on, this casual, open community work-space provides you the environment you need to get work done. Open Monday-Friday, 8am-6pm.